I had so much fun with this challenge! After I'd bought all my supplies and brought them home, I realized that it all reminded me strongly of kindergarten. 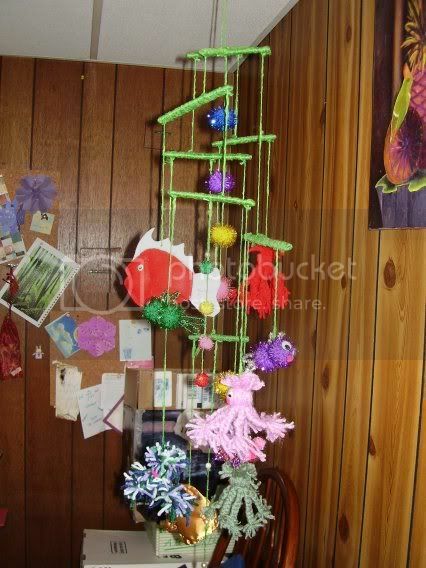 that brought up other random childhood associations, such as mobiles, and playsets, combined with the fact that the glitter pompoms remind me of sea urchins, and voila, my kitschy undersea kingdom was created! some of them are from a fishie swap; specifically, the red felt fishie is from dixie terror and the green yarn octopus is from jerome! I initially wanted green easter basket grass to drape over it like seaweed, but could NOT find it ANYWHERE. fortunately, my mom had this foul green yarn in her basement, which worked out very well! here is a closeup of one of my pompom fishies! they are so cute! 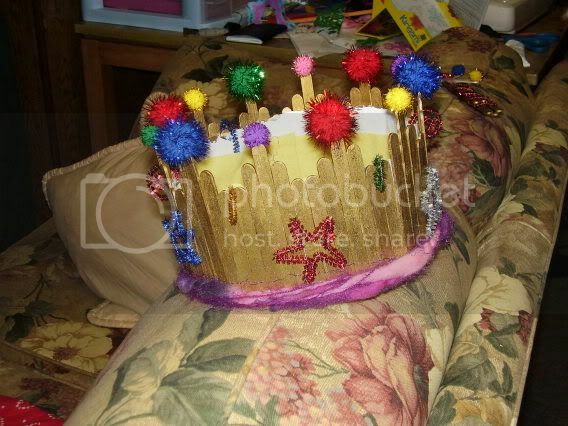 here is the sea queen's crown! it is made out of a whole bunch of popsickle sticks cut off at different lengths (actually, after I was about half way through, I realized it was much easier to snap them off with pliers rather than cutting them. oh well, live and learn.). 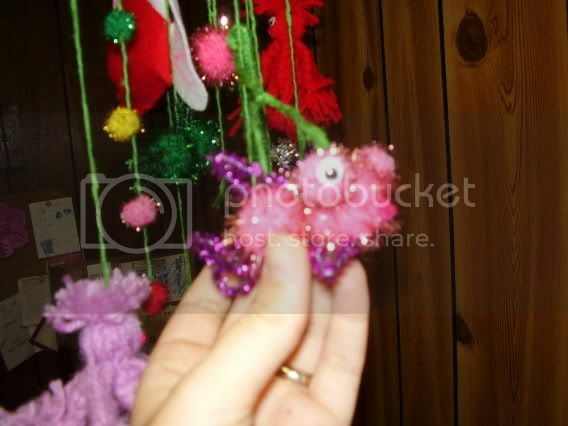 they were then glued to a paper backing and painted gold, covered with glitter, and decorated with pompoms and pipecleaner shapes, as well as a fuzzy yarn border. I also glued a strip of felt inside to make it more comfortable. 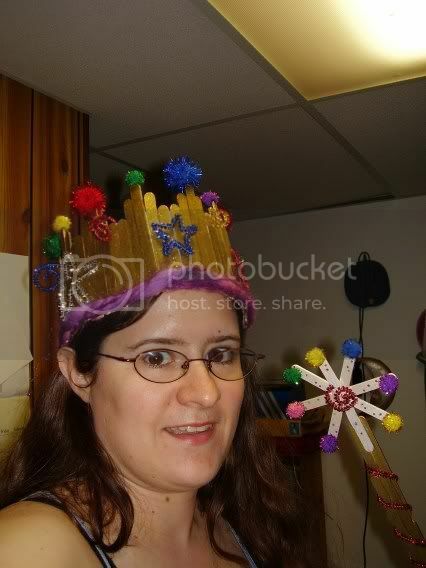 here is an awful picture of me modeling the crown and my scepter. i don't know what that face I am making is about. it is hard to take a picture of yourself, and yes, I am probably too old to be wearing a popsickle stick crown. and finally, here is an action shot of me using the sceptre to subdue the unruly fishies! I taught Head Start for a number of years. (A pre-school program for low income 3, 4, and 5 year olds.) I had this parent involvement program in which each student had their "special day." On their "special day" each student got to invite their parents (or another adult) to spend the day with them and they wore a crown all day long that the student and their adult guest would decorate first thing in the morning. I would totally use this crown for that!! It is MUCH better than the boring paper template I used! aww its so bright and cute, i love the sea creatures! This is really adorable. And in my opinion, one is never too old to wear popsicle-stick crowns. ok, this was what craftychica refers to as a "homegirl" craft -- i.e. no measuring involved. what I did was I took a strip of wrapping paper and wrapped it around my head and cut it so it fit. (it actually wound up being a little big, but the felt lining helps). Then I took my box of popsicle sticks (there, I finally spelled it correctly!) and broke them to length -- again, I was eyeballing it, but the long ones were left whole, the next longest ones I snapped maybe half an inch off of, and the shortest ones I snapped about an inch off of. Then I glued them onto the paper in pattern -- shortest, longer, longest, longer, then shortest again. 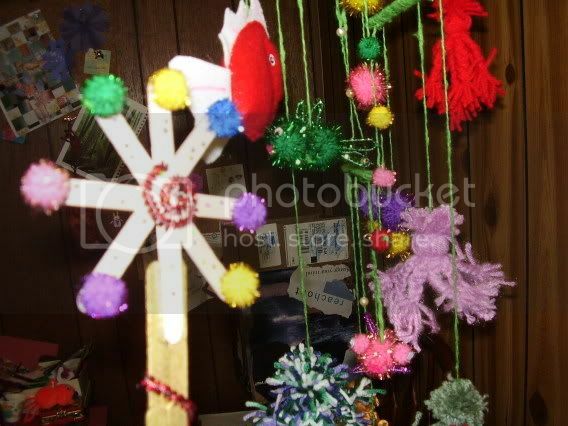 I used tacky glue, and, after I had all the sticks glued in place, I stood the whole thing up and positioned it as a circle and tied yarn around it so the sticks wouldn't fall off, and then left it until it dried. once dry, I used a great deal of tape (on the inside) to join the ends together, and painted it with gold craft paint. then I glued a felt strip inside and decorated it! The sceptre might be a good kid craft too -- I glued 4 sticks into a star shape and just kind of winged the handle by overlapping 6 sticks and gluing them together -- then I painted the star pearl white and covered it with tiny iridescent stars and painted the handle gold and decorated it with pipe cleaners and pompoms! really, the pictures do not do the sceptre justice, it is blindingly glittery! I hope these directions make sense! weve done the stickless septor for a chirstmas craft. gotta love the pom pom fishies!! I love the yarn octopi!! !